Last Tuesday Norwegian Cruise Line’s new 144,017-ton Norwegian Breakaway departed Southampton on her maiden voyage to New York, where she is due tomorrow. She will be named by the Rockettes this Wednesday. Meanwhile, another once-large ship, Royal Caribbean’s 73,937-ton Monarch of the Seas, has joined Spanish-based affiliate as the Monarch. And a survey from Norway tells us that cruise passengers are not necessarily those that spend the most money, at least ashore. Last week, the 4,028-passenger Norwegian Breakaway departed Tuesday for her maiden voyage, a seven-night Transatlantic trip to New York, where she is due tomorrow morning. Delivered last month by the Meyer Werft yard in Papenburg, Germany, she will be christened by Radio City Music Hall’s Rockettes on Wednesday. To sail year-round from New York, she will be a weekly Bermuda ship by summer and serve the Bahamas, Florida and the Caribbean at other times of the year. One of her quirks is the New York hot dog carts positioned at various spots around the ship. Chief among the new ships attractions, other than the fact that she is vastly better looking than the quirky 155,873-ton Norwegian Epic with her blue carbuncle atop, is that fact that she introduces for the first time promenade decks that include restaurants and bars that have both indoor and outdoor aspects to them. This area is called the Waterfront and it is sure to be copied by competitors as it allows passengers to commune with the sea, something that quite changes the play from earlier generations of cruise ships that forced passengers to look inside and spend money. The Waterfront features Cagney’s Steakhouse, Moderno Churrascaria and Italian eatery La Cucina, as well as Shaker’s Cocktail Bar and Malting’s Beer & Whiskey Bar and is home to the line’s first gelato outlet. 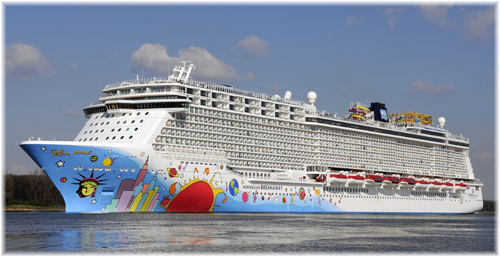 While not everyone will be pleased by the ship’s garish hull art by Peter Max, depicting various icons of the Manhattan skyline, she will indeed be the largest ship to trade year-round from New York. Royal Caribbean’s 2,384-berth Monarch of the Seas has now transferred officially to Spanish-based affiliate Pullmantur Cruises, where she has joined her sister ship Sovereign. This means that only one of the original trio, Majesty of the Seas, remains with Royal Caribbean, while her two sister ships become the largest ships in the Pullmantur fleet. Since last week, the now blue-hulled Monarch now offers weekly cruises from Cartagena to the Caribbean and the West Indies, and is forecast to carry up to 150,000 passengers in her first year on an itinerary that includes Cartagena, Aruba, La Guaira, Curacao and Colon, Panama, returning to Cartagena. 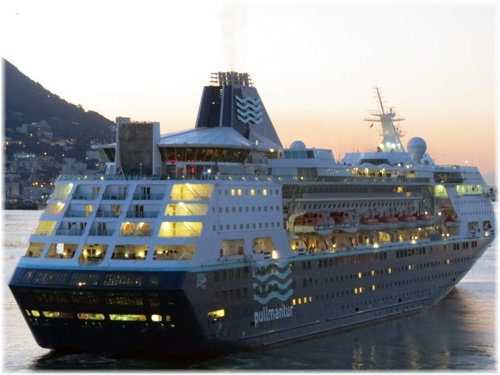 This move leaves Pullmantur Cruises with a fleet of five relatively modern ships – two sets of sister ships with the Monarch and Sovereign and Horizon and Zenith, which also operate for French affiliate Croisières de France, plus the Empress. All five ships were built for constituents of the Royal Caribbean Group, meaning that technically none of them is second-hand other than having transferred between fleets. Meanwhile, back in Florida, the Monarch’s 3- and 4-day Bahamas cruises from Port Canaveral have now been taken up by the 81,500-ton Enchantment of the Seas. More cruise ships are visiting the Norwegian fjords in recent times but it appears that their passengers only spend a fraction of what other tourists spend, which could be the scenario elsewhere. 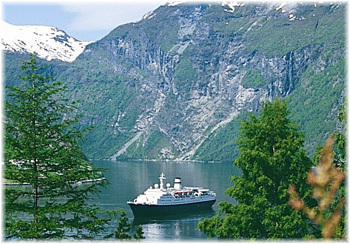 While overall visitor numbers to western Norway have declined slightly, cruise ship passengers have increased. But the average spend by campers is twice that of the average cruise passenger, according to University of Bergen Professor Svein Larsen. Larsen conducted a comprehensive survey of tourism in western Norway and recently published his findings in an article “Belly full, purse closed,” in the journal Tourism Management Perspectives. Over the last three years, he has interviewed more than 8,000 summer tourists, including 1,300 cruise ship passengers, and found that cruise passengers spend the least of all types of tourist. His research shows that the average cruise tourist on average spends about $50 a day ashore, with between twenty and forty percent not even leaving the ship. The average camper or hostel tourist spends twice as much as cruise passengers, while the average family tourist, staying in a hotel, tops the list, at an average of $165 a day, and that in addition to the hotel room. 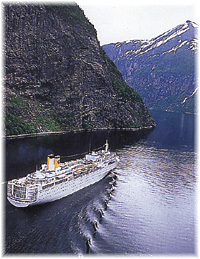 Larsen believes that the low spend per cruise tourist is caused by budget cruise offers, with for example, a 6-day cruise of the Norwegian fjords costing as little as $300, while the same journey by air and in individually arranged accommodation can cost several times that amount. 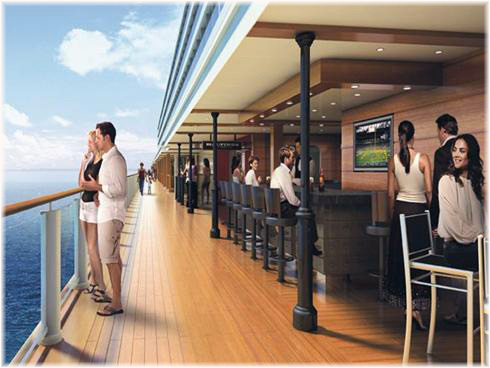 He concludes that taking a cruise is the new mass tourism, with tourists fed on board and even doing their shopping on board, with the cruise industry’s objective being to make money on board. He says that the only locals profiting from cruise ships are the port authorities, and occasional tourist guides and industries built specifically to cater for the cruise ship sector, with only limited resources reaching local shops or tourist attractions. He believes local authorities need to rethink their policies on tourism, to focus more on sustainable tourism, with young people and families spending a significant amount of money when on holiday, with for example, cruise passengers preferring to visit a non entry fee museum rather than, say, the Bergen Aquarium, where they have to pay an entrance fee. Professor Larsen says cruise passengers don’t leave much behind for the local economy with other research showing that there may be an additional legacy of negative environmental impact from cruise ships.